A collaboration with innovative sculptor Claudia Fitch, this work tampers with the formalities & theatrics of models on the runway. Both Skura & Fitch have a history of bending traditional forms to uncover subconscious underpinnings. Fitch designed 30 pieces using fabric & the moving form as her medium. Each piece is the basis for a unique brief dance performance on the runway. The movement responds to the nature of the clothing as much as the clothing reinvents the construction & social implications of apparel. Performance activity includes the runway as well as an onstage dressing room. This work began its first life in 1997, & was recreated & performed in various venues during the next six years. Original cast: Skura & Richard Waugh. Full length version: Margit Gallanter, Lila Hurwitz, Skura, & Richard Waugh. Lights by Ben Geffen. Performed in Seattle at University of Washington, Dance on Capitol Hill, Broadway Performance Hall, Bumbershoot, & Seattle Festival of Dance & Improvisation. 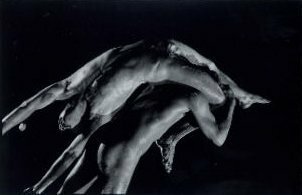 Commissioned & performed by Cornish Dance theater in 1999.